The 3 L’s of Kottayam! Just landed at Kerala – I’m actually in the middle of the tours of book-reading sessions of The Fresh Brew and happened to keep a promise that I had once made to one of my closest college buddies. The promise was to visit Kerala and I finally made it! My flight from Mumbai touched down at Cochin and from there it was a bus journey to come to Kottayam. Kerala – in all its pristine beauty was what kept me engaged along the way – and of course, conversation and catching up with my college friend. Latex: Because Kottayam is the country’s largest source of rubber and is (of course!) full of rubber trees all around. Letters: Because Kottayam is home to some of the country’s largest selling newspapers/magazines – including Malayam Manorama and Matribhoomi. 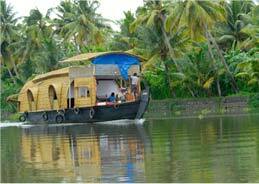 Lakes: Self-explanatory – the backwaters!